Andrés Iniesta has made his debut for his new team Vissel Kobe in a game against Shonan Bellmare in the J-League. He came on as a 59th minute substitute for Kazuma Watanabe, but was unable to save his side from 3-0 home defeat. It was quite some moment. After 22 years at FC Barcelona 16 of those in the first team, and winning 32 major trophies along the way, the midfield maestro, for the first time ever, was wearing the shirt of a different club. Back in action for the first time since Spain crashed out of the World Cup on penalties against host nation Russia, this was Iniesta’s first game at club level since his emotional farewell week at Barça in May, including a tearful goodbye to the Camp Nou following the game against Real Sociedad. And the above video is a timely reminder of how much Iniesta will be missed, with Leo Messi, Luis Suárez and his other team-mates offering all their best wishes to the departing star. 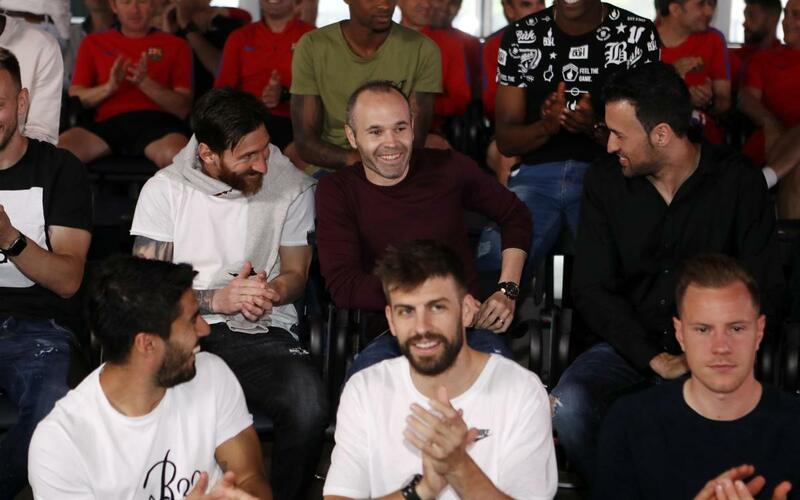 The whole gathered to watch the film - and their reactions, including those of Iniesta himself, are simply priceless! There's not a dry eye in the house. Click to play, sit back ... and enjoy. Lump in the throat guaranteed!